There are few things I hate more than food waste. So when I realized I could make delicious human food from fruit scraps that, years ago, I would have thrown in the garbage, I was thrilled. Years ago, I typed about turning fruit peels into yummy syrup, but I recently learned you can also use fruit peels and pits (or cores) to make jelly. Since I've been making a lot of applesauce lately (see my super easy method here), I've been saving up apple cores in the fridge. 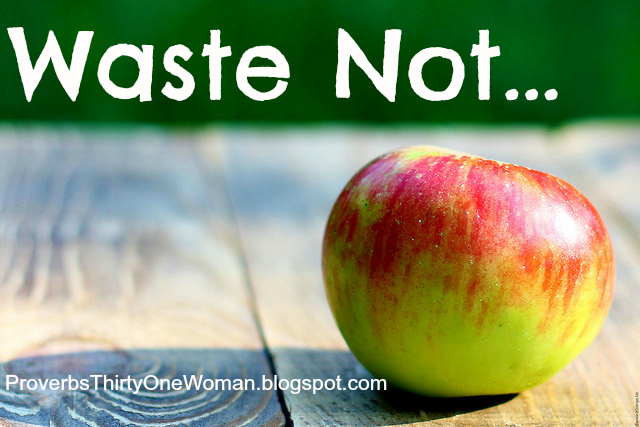 Generally speaking, I don't peel our apples, but if you do, you can save up the peels, too. And with those cores and peels, you can make scrumptious jelly. Even more good news? The recipe doesn't require pectin, so you can use as little sugar as you like! If you are new to canning, please review basic canning procedure, here. 1. 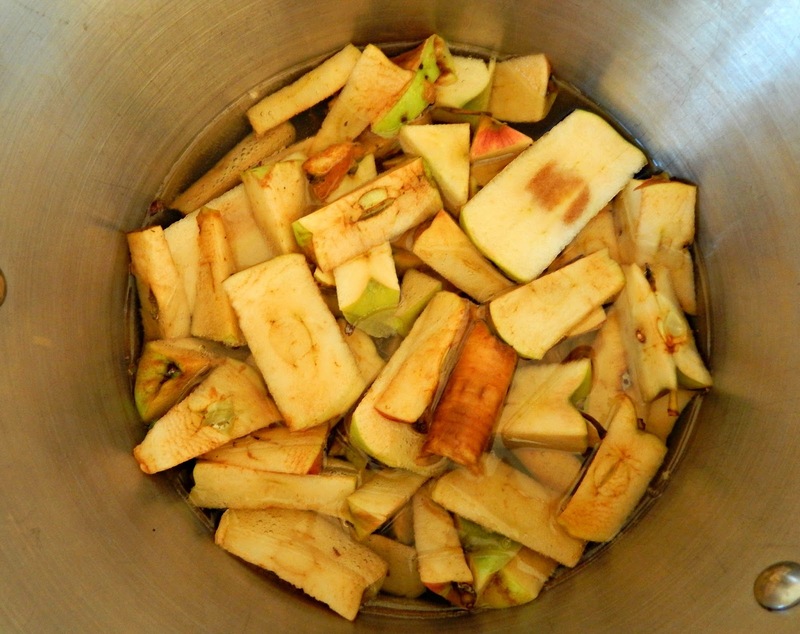 Place a bunch of apple peels and cores in a large pot. Cover, just barely, with water. Bring to a boil. Cooking down the apple cores. 2. Reduce the heat to medium and cook, stirring frequently, until the cores and peels are mushy and the liquid is reduced by about half. 3. Strain through a fine sieve, reserving the liquid. (Use a stainless steel bowl to catch the liquid; ceramic or glass may break when the hot fluid touches them.) 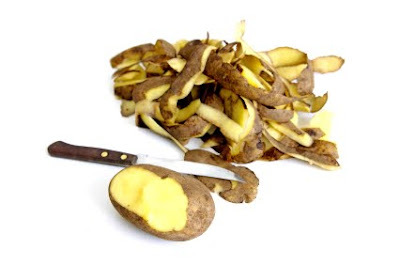 Toss the peels and cores to your livestock or throw them in the compost. Measure the liquid. 4. Wash the pot. (You don't want any bits of apple debris in your jelly.) Pour the liquid into the pot. 5. Add granulated sugar. You can use as little or as much as you desire. My original, old-time recipe called for 1/2 cup granulated sugar for every cup of liquid, but I think that's quite a lot. I used about 3 1/2 cups of sugar for every 5 1/2 cups of liquid, and even that might have been more than was needed. So I recommend adding perhaps a half cup of sugar at a time, letting it dissolve, and tasting the mixture until you like the flavor. 6. If desired, you can also season the jelly. I used a little ground cinnamon and ground cloves. You could use cinnamon sticks and whole cloves, too, and just fish them out before jarring the jelly. Or try a little apple pie spice. 8. Bring to a boil over high heat, stirring frequently. When the jelly reaches 221 degrees F., it's done. Remove it from the heat. 9. Ladle into hot jelly jars, leaving 1/4 inch headspace. Process in a water bath canner for 10 minutes. Or, allow the jelly to completely cool, ladle into freezer safe containers, and freeze. P.S. Worried about the poison in apple seeds? It is true apple seeds contain amygdalin, which breaks down into hydrogen cyanide when chewed. But according to Nordic Food Lab (and many other expert sources), when exposed to even a little bit of heat, cyanide is no longer toxic. In other words, his recipe won't harm anyone! It's been an interesting week on the homestead. We began by celebrating the return of water, but shortly after sighed because the washing machine began spurting water all over the floor. Then the propane oven leaked gas (my fault for accidentally - again! - turning on one of the knobs when reaching for a high shelf above the stove). Then the baskets of apples I'd picked began rotting. We first noticed it after an evening out. We walked into the house and BAM! rotten apple smell. I sorted through the apples right then and there and was happy to only have a handful for the compost bin. But the next day, I imposed upon my mom-in-law (for her stove, her jars, her kitchen) to make applesauce. Today, I'm making apple pie filling for the freezer. Where I will put that apple pie filling, I don't know, because my freezer is full of yellow plums. Even after making jars and jars and jars of (delicious) plum jam, plus canned plums, plum pie filling, and dehydrated plums. In the meantime, the prunes (and maybe more apples) need harvesting, the dehydrator never stops, and the wild berries are begging to be picked. It's a little overwhelming, all this abundance. This morning, though, my husband comforted me: "Honey, there's no way you can preserve every piece of fruit on this homestead." Yes, I knew that in my head, but my heart felt relieved to hear it spoken aloud. Because it's true; when you have nine apple trees and eleven plum trees and no animals (yet!) 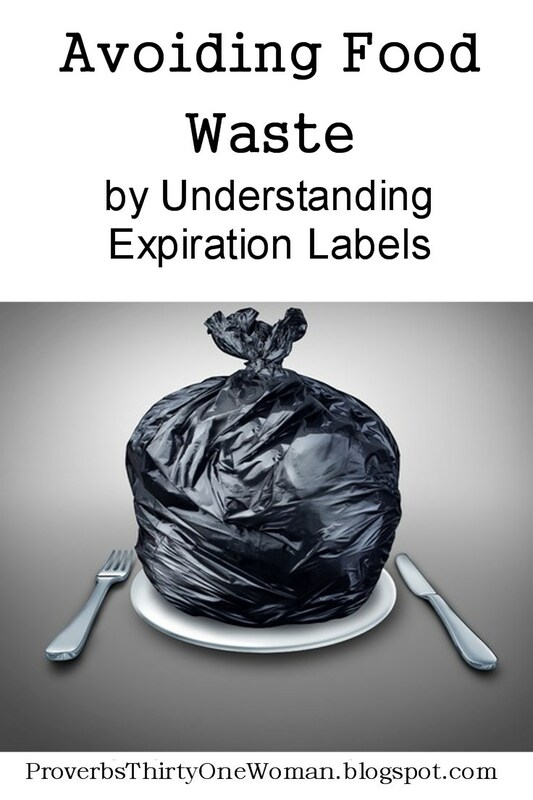 to help you consume them, there's going to be some "waste," no matter how much you give away or preserve. I put "waste" in quotes for a reason, though. Because fruit that falls to the ground or stays on the trees or vines feeds the wild critters. Once we have our homestead animals, they will enjoy fruit that's less than perfect, too. And there's always the compost bin, where "waste" turns into a valuable resource for building up the soil. So, I take another deep breathe (usually taking in the amazing smell of apples and cinnamon combining) and thank God for this gorgeous place and the longish journey, full of miracles, it took to get here. * Title image courtesy of Valdemar Fishmen. that looks freshest, pay, and you're done. But when you have even one fruit tree, you'll soon discover you need to put a little more thought into gathering fruit. 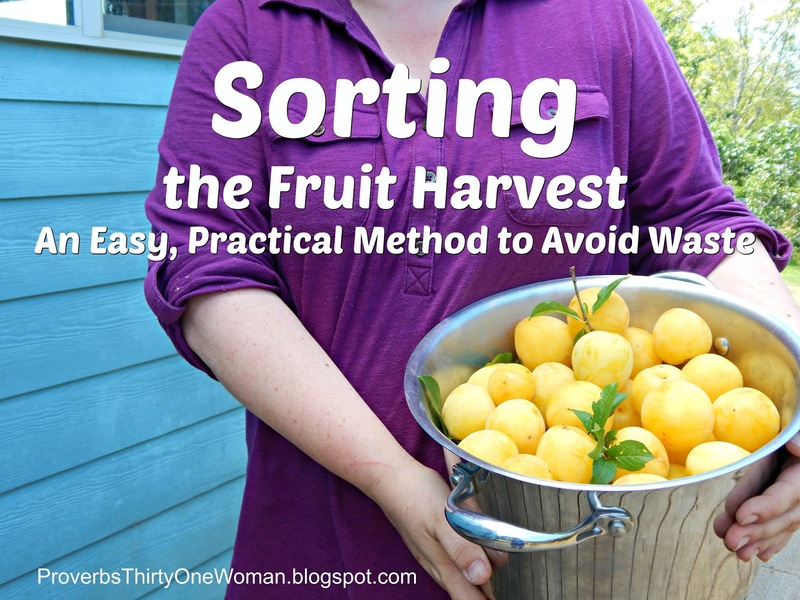 The method doesn't have to be complicated or terribly time consuming, but if you sort your fruit, you'll waste a lot less of it, and preserving it through freezing, dehydrating, canning, or cold storage will be much easier. Here's how I go about sorting our fruit. Next, I like to gather everything I can reach by hand, then use our fruit picker for the rest. 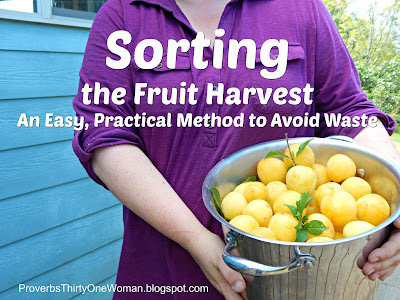 If you want, you can try to sort the fruit as you pick, putting the very ripe (its-gonna-be-bad-tomorrow) fruit in one bucket and the rest of the ripe fruit in another. I prefer to get all the picking done without sorting, so I put all the picked fruit into one bucket (or more, as the size of the harvest dictates). Often as I pick fruit, more fruit falls from the tree, so after harvesting the tree, I look around on the ground again for good fruit and place it in my harvesting bucket(s). When I bring the fruit indoors, I put the windfall fruit aside and separate the fruit that's super ripe (its-gonna-be-bad-tomorrow) from the rest of the ripe fruit. Super ripe (its-gonna-be-bad-tomorrow) fruit: Eat it within hours; or prepare it that day in a dish (like cobbler or pie); or preserve it. Super ripe fruit is, in my opinion, best preserved by making jam or maybe pie filling. However, I usually freeze the fruit whole and make jam or filling when I'm not so overwhelmed with preserving the rest of the harvest. Windfall fruit: This type of fruit often has bruising, so it's also good for jam, pie filling, or (in the case of apples) applesauce. Or, eat it within hours of picking off the ground. Ripe fruit: Eat fresh, whenever possible. I recommend sorting through the ripe fruit every day, to look for fruit that is getting super ripe. Always eat this fruit first, or freeze it, or preserve it in some other way so it doesn't get wasted. Ripe fruit is also excellent for dehydrating; canning whole, halves, or in slices; or freezing in slices. Recently, a reader commented that I should give much of my fruit to charity. We do give away some of our harvest, but we also think long term about our family's needs. Many Americans think only about the food needed for today or tomorrow - or maybe for the next two weeks. But homesteading philosophy dictates we think ahead at least a year. So yes, we have too much fruit for our family today, but we don't have too much fruit if we think in terms of the year. The reason I preserve so much while the harvest is ripe in the summer is that this food will be our fruit when fruit is no longer in season. This way, we aren't encouraging the modern idea that food should be shipped or trucked thousands of miles to us, and we know we can always have healthy fruit that hasn't been sprayed with chemicals or canned with unwholesome ingredients. my children dinners that were different from what my husband and I ate. Ahem. Then our daughter came along. Three months early, in fact. And her months with a feeding tube made her sensitive to eating certain textures. And her tiny little body didn't tell her to eat nearly enough. So - yes, I started making her special meals, full of high calorie foods I knew she'd eat. Then my son came along - a big, full term baby. There was no need to make him special meals, but I didn't want to show favoritism...So, in the end the children ate one meal and we parents another. Oh, how the mighty fall during parenthood. Fast forward a few years, and I'd finally had enough of cooking double meals. I decided both kids needed to eat whatever the adults ate...and today both my kids - really without much struggle - do eat the same meal we do. But, as I'm sure is true in most houses, some dishes go over far better with the kids than do others. At our house - and maybe yours - certain foods and textures just don't get eaten by the children. For example, neither of my children likes chunks of tomatoes in cooked foods like chili. Well, I've finally come up with a solution to that. Maybe it's obvious to some people, but it sure wasn't to me: Puree the offending food. You see, I noticed my kids ate my mother-in-law's chili without complaint, whereas they tended to eat around the tomatoes in my chili. "Oh, I just puree them in," my mother-in-law told me. DUH! Why didn't I think of that! 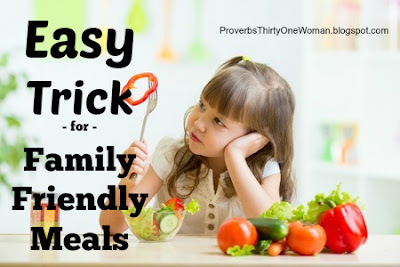 Of course, this works not only for tomatoes, but also for onions, sweet peppers, or just about any other ingredient your kids don't like chunks of. The solution is SO simple. And simple is SO good. 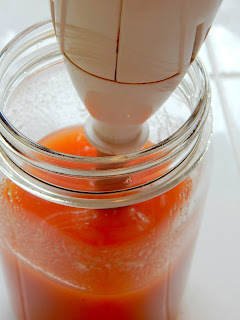 * If you use canned tomatoes, you ought to consider buying them in a glass jar. That's because the acid in tomatoes tends to leach chemicals from cans. This not only makes the tomatoes taste weird (you'll be pleasantly surprised by tomatoes canned in glass), but it puts potentially harmful chemicals, like BPA, in your body. it. "My family says no, because bugs have been eating it," the man typed. This received a variety of replies, but only one respondent typed what I was thinking: "Well, if you don't want to eat veggies with holes nibbled in them, you can go and buy some poison, sprinkle it on your food, kill all those nasty bugs, and you'll have 'perfect' little veggies to eat." Last year, my mom- and sister-in-law attended a class on orchard keeping. At the beginning of the class, the teacher asked everyone to come forward and choose an apple from a box on his desk. When every student had done so, all the perfect-looking apples were gone, and all the imperfect apples - those that were misshaped or had worm holes - were left in the box. "Until this changes - until people start choosing and buying produce that's less than perfect, organic food will not become the norm," the teacher said. Did you know that in the U.S., 40 - 50% of all food that's ready for commercial harvest never gets eaten? Some of this is due to modern methods of harvesting - machines that don't take corners well, for example. (Which, incidentally has lead to a rise in the biblical practice of gleaning - not a bad thing!) But a good portion of that is food that's misshapen or otherwise considered imperfect - for example, carrots with two or more roots - and are just thrown away. Last week, I saw an encouraging news story. In France, one supermarket chain is putting an end to this kind of food waste - and helping consumers reduce their food bills, too. They are taking all that imperfect produce ("inglorious fruits and vegetables," they call them) and putting them on their shelves at reduced prices. And the French are eating them up! So much so, the chain is having trouble keeping enough "inglorious" produce in stock. And while the news story doesn't mention it, the acceptance of less than perfect produce opens the door wide to more - and more affordable - organic produce. Why? Because organic practices lead to more bug nibbles - and because an item like a perfect-looking organic apple takes many more man hours to produce, and therefore costs much more than conventionally grown apples. What do you think? Are you willing to eat imperfect food in order to end food waste and make organic more affordable? "My produce always goes bad before we can eat it all," I overheard a woman complain to her friend. "I spend all this money on healthy food, and most of it gets wasted!" She's not alone. Experts estimate Americans throw away 14 - 25% of their food, costing the average family $1,365 - $2,275. This is tragic, considering an estimated 842 million people worldwide don't have enough to eat. * Buy only what you can reasonably expect to eat before it goes bad. Even if it means extra trips to the farmer's market or grocery store. * Keep one drawer in the fridge for fruits, and another for veggies. Never store them together because many fruits release ethylene gas - a ripening agent that makes veggies rot faster. * Freeze certain veggies. On shopping day - or perhaps the day after shopping - chop up produce you'll use for cooking, like onion, green onions, herbs, and sweet peppers. Pop them in a freezer bag, and you won't have to worry about them going bad. * Use up the most perishable items first. For example, snack on bananas before you start in on the apples. You'll also want to plan your meals so the most perishable foods get used up first. 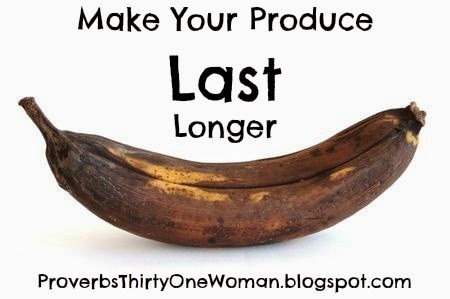 * Learn to use up just-about-to-spoil produce. You can make smoothies with them. Or freeze them. Or dehydrate them. * Don't store countertop produce in a hot or sunny location. Keep them in a cool, dark location and they will remain fresh longer. * Immediately remove produce that's overripe or spoiling. For example, if you keep an apple that has a spoiled spot in with the other apples, it will hasten the spoiling of them all. I wouldn't want to have to do without my Progressive Keepers. 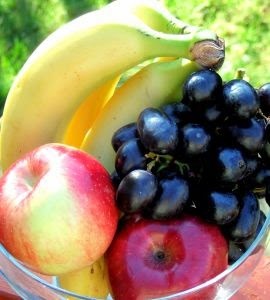 * Don't wash fruits until you're ready to eat them; experts say water decreases fruit's life by 40%. Some people swear by rinsing them in vinegar and water; I've never tried this becauee I find fruits and berries last a long time in my Progressive containers. * Remove ties and rubber bands before storing. * Don't stuff fridge drawers. If you let produce have a little room to breathe, the food will last longer. * Place plastic wrap over the stem end of bananas. Some people claim separating them makes them last longer, too, but I haven't found this to be the case. And while you're at it, buy green bananas and let them ripen on the counter. They'll last many more days this way. * Consider whether it needs ripening. Avocados, tomatoes, stone fruits, mangoes, melons, pears, bananas, and apples, will continue to ripen if you leave them on the counter. Citrus, berries, grapes, and bell peppers will not ripen on the counter and will spoil quickly there. * Buy from local farmers. The food is fresher than what you buy at te grocery store; therefore, it stores longer at home. * Don't toss it just because it looks bad. With heads of lettuce or cabbage, remove the outer leaves and you'll find fresher leaves inside. Cut away bad spots in fruit, eat the rest. * Compost! If all else fails, compost spoiled produce to feed the soil in your yard! Also, if you have critters (like chickens and rabbits) that can eat produce, it's fine to give them wilty, dry, or otherwise unpalatable produce - but never give them anything that's rotten. Recently, I was shocked to hear a friend described how she froze extra tomatoes from her garden. It was complicated! "Really," I told her, "it doesn't have to be so hard! In fact, it should be almost magically easy!" 1. Place clean, dry tomatoes in a single layer on a rimmed baking sheet and place in the freezer. 2. Once the tomatoes are hard, transfer to a freezer bag. Tomatoes frozen in this manner may later be canned, if you like, or you can use them like fresh tomatoes for cooking. As the tomato growing season ends, you'll want to know this trick, too. When frost threatens to kill your tomato vines, pick all the green tomatoes off your plants and bring them inside. Place them in a single layer in your pantry. With time, they will turn red. They won't be quite as delish as garden-fresh tomatoes, but they'll be better than store bought. 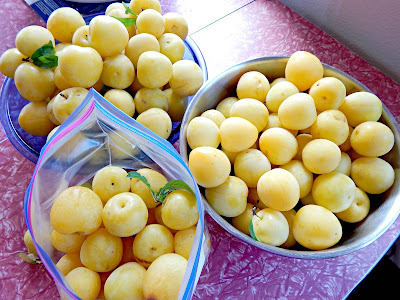 As they ripen in the fall and possibly the winter months, I often freeze them. Once all my green tomatoes are red, I usually can them. Or you can just use the reddened tomatoes fresh, as they become available. 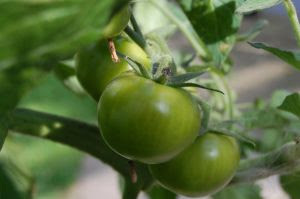 Or, check out my post on how to cook with green tomatoes. Have you heard about the "Zero Waste Home?" Well, that's not my house. (Something I'm glad for, since the zero waste home seems a bit obsessive-compulsive to me.) But over the past few years, we've definitely cut down on the amount of trash we send to the landfill. And not only is it not hard - it saves us money. The first important step to reducing household waste is to compost. It's also a must if you have any type of a garden; compost is expensive to purchase and so easy to make. 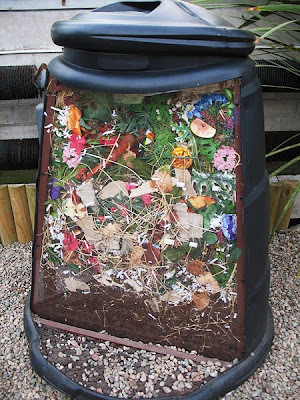 To learn more about how to start your own composting pile(s), read my post here. But it really couldn't be easier; simply pile organic material and let it decompose. If you want it to decompose faster, you can be mindful of what you put in and how often you turn the pile. 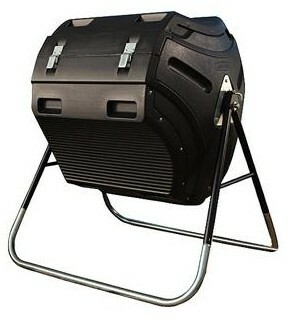 I've also found things compost faster in well ventilated, rotating compost bins made from black plastic - but even just a pile in a corner of your yard will eventually turn to beautiful compost that enriches the earth. I sometimes also use the old fashioned method of trenching: Just dig a hole somewhere in your yard, put compostable material in it, and cover it up. In my experience chickens don't turn their noses up at any food - and many foods you might think they couldn't or wouldn't eat (like sour, curdled milk), they actually adore. We rarely recycle - primarily because recycling uses up a lot of fuel and energy. Besides, why send it off somewhere if we can use it somewhere on our "homestead?" How do you reduce waste in your household? This post featured on Homestead Abundance. 1. Wasting the food God gives us is being a bad steward. 2. My husband and I work too hard to waste money on food that will just spoil. 3. There are many hungry people in the world. 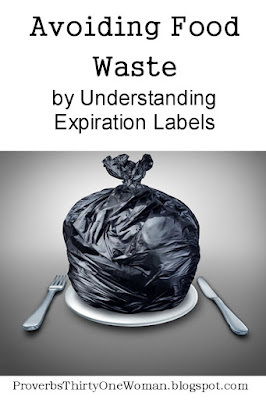 To allow food to go to waste shows callousness to their plight. 1. I plan our meals and use up certain perishable items first. (To learn my simple method of meal planning, click here.) For example, if I buy squash, I know it won't last very long in the fridge, so I serve all the meals with squash in them within a few days of purchase. If I buy cabbage, I know it will last for months in the fridge, so the cabbage meals can wait until the more perishable food is eaten. 2. I freeze the food that's most likely to go bad in the fridge before we can use it. For that second method to work, you just have to pay attention to what seems to go bad in your fridge. Often, it's produce. In my house, it's mostly fresh herbs, onions, and bell peppers. In your house it might be something entirely different. Some people like to freeze these foods as soon as they get home from the grocery store. If you can do that, wonderful. I cannot; by the time we've finished shopping, my kids are tired, hungry, and cranky - and I'm usually pretty beat, too. Instead, I prefer to freeze food in spare moments a day or two after shopping. I like to freeze meats first. They are expensive and seem to go bad faster than many other foods. I simply divide them up into appropriate servings, place them in Ziplock bags, and freeze. (Don't freeze in the plastic wrap you buy them in or the meat will suffer freezer burn.) If I'm really "with it," I'll brown hamburger before freezing it, to save time later. Next, I work on herbs. I chop them and pour each type into one Ziplock bag. When it's time to cook with them, it's easy to just reach into the bag and grab what I need. If needed, I knock the bag on the side of the counter to break apart chunks. Next comes other vegetables - in my house, mostly onions and sweet peppers. Again, all I do is chop them and put them in one bag. I've also successfully frozen carrots, green onions, and celery without doing anything special to them first. Just chop into the size you'll use for cooking and place in a bag. * I'm waiting for something to cook. * my first grader is reading to me. * I just happen to have a spare few minutes. Be sure to mark the Ziplock bags with the contents and the date. Freezing these most-likely-to-rot foods isn't difficult, doesn't have to take much time, saves you cooking time later, models good stewardship, and saves money. What foods are most likely to rot in your fridge? If you need help knowing how to freeze them, just leave a comment below, and I'll be sure to answer your questions. Homemade and canned chicken stock. This post originally ran in 2010, but I've updated it with more complete canning information. NOTE (5/23/13): I recently learned that bones used for stock making can be used more than once. I've read of people using them up to 13 times (! ), but I have personally used them up to three times. (After that, I ran out of refrigerator space.) The trick is to add a splash of white vinegar to each new batch, to help leach the bones further. 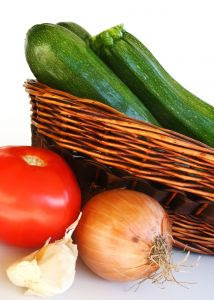 The vegetables used in stock can be used twice, but you should add fresh vegetables, too. If you've never used homemade stock (some people call it broth) for cooking, you're missing out on a real treat. It is so much better (and cheaper) than anything you can buy in a store - and it's not difficult to make. Making stock is also a great way to use up scraps of food - peelings from vegetables, wilting vegetables left in your fridge, or poultry, meat, and seafood carcasses. If you're not sure how to use stock, try using it as a substitute for water or wine in any savory recipe. You can also use it as a base for soups and stews, or add it instead of water in things like rice. To save a load of calories, you may also use it in place of butter or oil when sauteing. 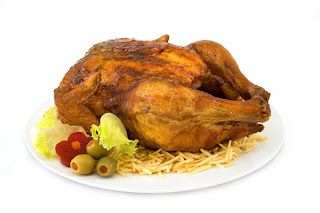 Use the carcass (the bones and whatever leftover meat or organs that you don't want to eat) of a whole chicken (or any other type of poultry) and a number of vegetables, either scraps or whole. You don't need an exact recipe for the veggies, but here's one to experiment with: one large onion (quartered; papery skin in tact), three carrots (chopped into pieces small enough to fit into the pot), four stalks of celery (also chopped into large pieces so they fit into the pot), one tablespoon of whole black peppercorns, a couple of bay leaves, a little salt, and perhaps a few garlic cloves. To make the stock richer, you can roast all the meat, bones, and veggies first in a 450 degree F oven for about 45 minutes. But if you're pressed for time, it's fine to skip this step. Place all the ingredients in a large pot, cover them with water, and simmer for between two and six hours. If necessary, add water to keep the poultry and vegetables covered. Allow the stock to cool slightly, then carefully strain the liquid into a large bowl. (Toss the plant based scraps in the compost bin; you may wish to reserve the bits of meat that fell off during cooking for a casserole or some similar dish. Chickens also love the scraps leftover from stock making; just remove the bones first.) Refrigerate the stock overnight. The fat will rise to the top of the pot; scoop it away with a spoon. For beef stock, use meat bones (beef, lamb, pork, ham, veal, or venison all work). Add vegetables and pepper. You may also wish to add one or two quartered tomatoes. Add eno ugh water to cover everything and proceed as if making chicken stock. UPDATE: For more detailed instructions for making beef stock, please click here. For vegetable stock, you may use nearly any vegetable - except broccoli, cauliflower, and cabbage, which are too potent for a good stock. Tomatoes (which are really fruit) should be kept to a bare minimum; I wouldn't use more than one, quartered. Fresh vegetables work, but peelings and left overs are perfectly fine, too. Some good choices for making vegetable stock include garlic, onions (including green onions), potatoes (including sweet potatoes), carrots, celery, zucchini, squash, mushrooms, corn (including corn cobs), green beans, peas, and beets. Salt, pepper, and bay leaves are good choices, too. Like all other stocks, scraps work just fine for making fish stock. Use about fish, shrimp, crab, or lobsters and their shells. You'll also need about two tablespoons of butter, two large quartered onions, four garlic cloves, one or two celery stalks, parsley, one tablespoon of fresh lemon juice (in a pinch, you can use the bottled stuff), and one teaspoon of whole black peppercorns. You can also include a cup of dry white wine. In a large pot, melt the butter and sauté the garlic, onion, and celery until soft. Place all the remaining ingredients in the pot, adding about a gallon of water. Proceed as if making chicken stock. Seafood Stock: I can find no tested guidelines for canning seafood stock. For safety, freeze it instead. So, here is a basic recipe for meat stock. Add your ingredients to your stock pot and simmer, stirring occasionally for about 4 hours. Add more water if necessary to keep the ingredients covered. Strain out the solid ingredients and refrigerate stock for a few hours. The fat layer can easily be skimmed off the chilled stock, making it ready for use or the freezer. Seafood stock comes in handy for many recipes. You can use any inexpensive white fish scraps, bones and trimmings (your seafood market or grocery store probably sells fish packaged for just this purpose). You can also use crab, shrimp and lobster shells for adding flavor to seafood stocks. Melt butter in bottom of stock pot and sauté onion, garlic and celery for about 5 minutes or until soft. Add remaining ingredients and simmer for about an hour. Periodically skim off foam that will appear at the top of pot. Cool and strain out solid ingredients. Your stock is now ready for use or for the freezer. When I took my children for a walk today, on a hunch I brought along a plastic shopping bag. I was glad I did, because in several spots on the sidewalk there were tiny green apples. We came home with about four pints - a good beginning. Why would I want those super sour apples that fall from the tree early and are usually looked upon merely as mess makers? So I can make apple pectin! 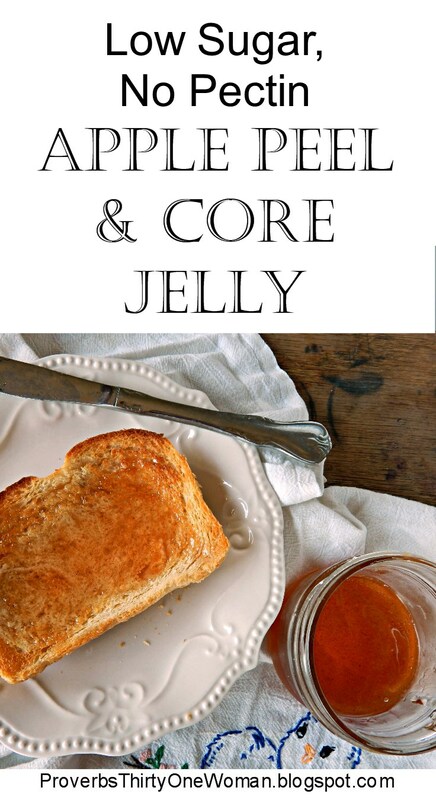 * Ideal for jam and jelly making; it allows you to use less sugar than if you use ordinary store bought pectin. * Fights cancer; a study by The University of Georgia found that apple pectin may help treat prostrate and other cancers, reducing cancer cells as much as 40 percent. Pectin may also reduce the risk of colon cancer. * Is good for cholesterol, according to The University of Wisconsin School of Medicine and Public Health. * Apple pectin has even been used to combat radiation in Russia. 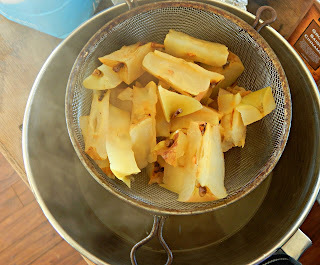 You can learn how to make apple pectin here. The best apples for making apple pectin are those that are very sour - ideally unripe apples or crab apples. If you have your own apple trees, this is no problem at all; at this time of year, as the fruit begins growing larger, overcrowded fruits fall to the ground and are perfect for making pectin. But if you don't have your own apple trees, you'll need to get more creative. You can save all the throw-away parts of ripe apples you eat (including the pits and peels), but you'll get better pectin if you look around for apple trees in your neighborhood that have fallen, unripe fruit. Only gathering a few at a time? No worries; just freeze the apples whole (or the apple scraps, as is) until you have enough to make a batch of pectin. Do you ever look at your curbside on trash day and wonder how it is your family throws away so much? I do, and lately I've been making an effort to reduce the amount of stuff we have to pay someone else to haul away. For me, this isn't a "green" thing. Most of what my family throws away eventually decomposes and improves, anyway. But I am interested in using what we have wisely - and in reducing our garbage bill. But whatever motives you to reduce your garbage, here are a few ideas. Note that I'm not really interested in the zero-waste theory. I find that a bit obsessive. Or compulsive. Or something. People have always thrown some things away. My approach is more moderate, as you will see. 2. Buy from bulk bins. Some stores allow you to bring in your own containers, weight them, and fill them with items from bulk bins. This is a bit of trouble if you do "big" grocery shopping, but it makes the pantry more organized and it reduces the amount of waste coming from your kitchen. 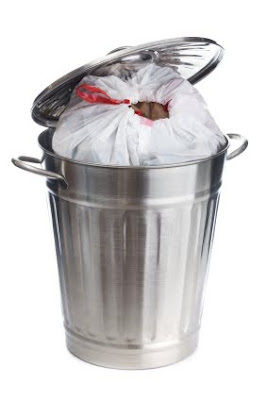 If you can't bring in your own containers, use store-provided paper bags, which can go into the compost bin. 3. Reuse or give away. Old peanut butter and coffee jars are terrific for holding and organizing a wide assortment of items, from snack foods to nails. Children's clothes too small? Refashion them into clothes that fit, or give them away to someone who can use them. You get the idea. 4. Can your own foods. Store bought canned goods are convenient, but all those cans take up quite a bit of space in the garbage can. With home canned goods, the jars are used over and over again; you only throw away (or recycle) the small, flat lids. 5. Rethink food storage. 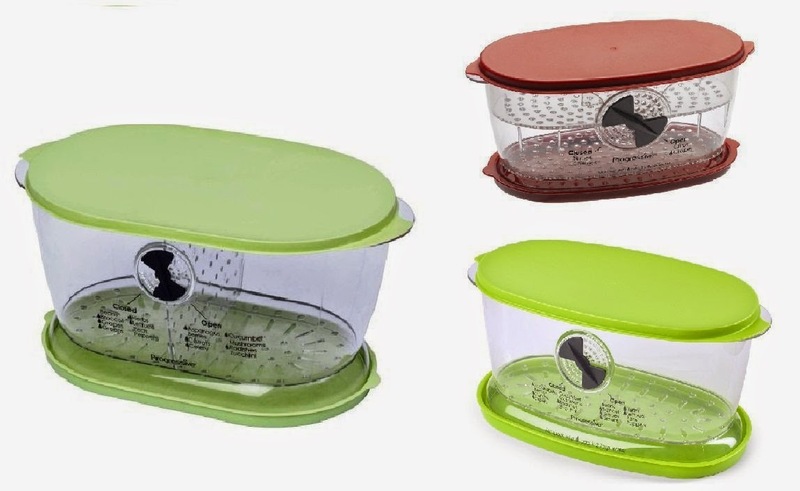 Whenever possible, use reusable containers (ideally, glass) for storing leftover food, or repeatedly re-use plastic freezer bags. 6. Replace paper towels and napkins with cloth. 7. Learn to use all the food you buy. Make a weekly or bi-monthly list of dishes you'll serve and post it on the fridge; learn my super-easy method here. Make sure to use all leftovers, use up the edible parts of the food you buy, and organize your fridge to end food waste. 8. Avoid produce in plastic. First of all, do you really want fresh food wrapped in chemically-created plastic? And how can you tell how fresh (or not) the food is? Plus, you just have to throw all that plastic away. 9. Avoid processed foods. Not only are they unhealthy, but they create way more trash. 10. Give your children used paper for drawing and crafts. Whether it's junk mail or paper from your computer's printer, if it's not printed on two sides, it's still useable! Once your children have used up the paper, compost it. 11. Spend a month really paying attention to what ends up in the trash can, then brain storm ways to reduce your most persistent "offenders." Don't feel you have to make a whole bunch of changes at once. Try one idea a month, if needed. * You may notice recycling, in the modern sense, is not on my list at all. That's because recycling uses up an inordinate amount of energy - and many towns only recycle a portion of what residents put out for recycling. The rest goes to the land fill. How do you reduce your household waste? * Garbage Soup. Here's a very old idea that most Americans have lost track of: Keep your "throw away" bits of food and turn them into soup. 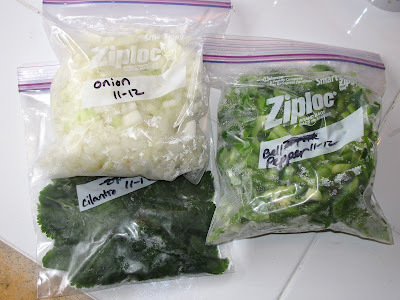 Keep the ends and peelings (including the papery outer skin) of onions and garlic, vegetable and fruit peelings, broccoli and asparagus stems, scraps of meat, poultry and meat bones, and all that other kitchen "waste" you normally toss. Throw them in the freezer until you've accumulated enough to put them in a pot with some stock (or just water, if you've got poultry or meat bones). You'll need to use a wee bit of caution here. Just one or two small pieces of citrus peel is plenty; the same thing goes for pepper and leafy green scraps. If you prefer, you can strain this mixture and just use it as stock, sending the cooked up bits from plants (but not animals) to the compost bin. * Brussels Sprout Leaves. The smaller (no more than a woman's palm size) leaves at the top of the plant are great sliced and sauteed in a little olive oil and garlic. And if you lop off and eat the crown of leaves at the top of the plant, small balls of leaves will grow that can be eaten any way you eat Brussels sprouts; they taste a bit more cabbage-y than Brussels sprouts do. * Potato Peelings. I prefer to leave the peels on; they pack some good nutrition. I even leave them in place when I'm making mashed potatoes. But if you prefer to remove them, try deep frying them in 350 degree F. oil. Sprinkle with salt and maybe some paprika. * Root Veggie Tops. 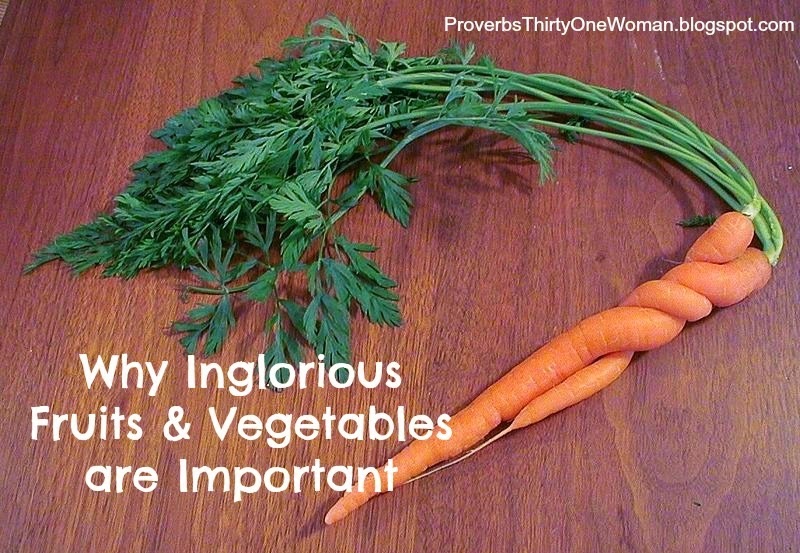 The leafy tops of carrots can be used just like parsley. The leafy tops of beets are delicious sliced into thin strips and sauteed with olive oil, garlic, and a little salt. The leafy greens of radishes can be cooked the same way. 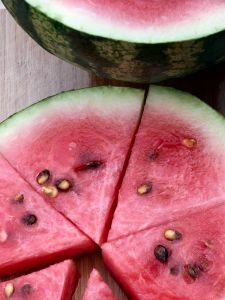 * Watermelon Rinds & Seeds. The jalapeno pickled watermelon rinds I've made are terrific for pickle lovers who like a bit of a twang. But there's also the traditional, sweeter version using spices like nutmeg and cinnamon. If you don't can, you can just store the pickles in the fridge. You can also remove the green part of the rind and use the whitish part just like you'd use cucumbers. I also hear you can roast watermelon seeds and eat them! * All Things Nasturtium. All parts of nasturtiums above the ground are edible. The flowers and leaves are mostly used in salads. The seed pods can be pickled. * Sweet Potato Leaves. Both the leaves and stems of sweet potatoes are great in soups, stews, and sauteed. Stick to smaller leaves - no larger than a woman's palm. * Lettuce stems. If you grow leafy lettuce, you can harvest the thick center stem once the weather gets warm and the lettuce leaves turn bitter. It's a little bit of trouble to peel those stems, but then you can cook them (roasted or sauteed are my preferences). They are tender and yummy. * Pea, Kohlrabi, Cauliflower Leaves. If you choose the younger leaves of peas, they taste just like the peas themselves, and make a great addition to salads. Kohlrabi and cauliflower leaves can be cooked just like collards or other dark greens. * Celery & Fennel Leaves. Use in small quantities, minced, to perk up and season a dish. * Chard & Collard Ribs. If you purchase older plants with thick ribs, or you just let them grow too long in your garden, you can cut away the ribs and simmer them in a little wine, water, or stock, then drain and drizzle a little oil and a wee bit of salt. * Corn Cobs Milk. Remove any remaining kernels and simmer with onions and carrots for a vegetable stock. * Tomato Leaves & Stems. Wrap them in some cheesecloth and place in the soup pot during the last 10 minutes of cooking. They add a unique scent. 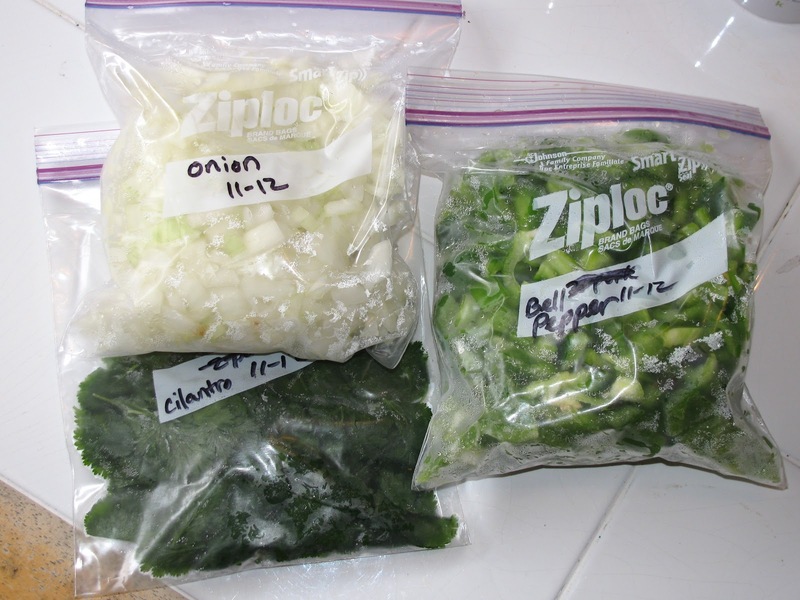 Remove the cheesecloth bag after 10 minutes and toss the whole in the compost bin. * Cabbage Mini Heads. Once you cut off the main head of cabbage, consider leaving the plant in place. It will grow mini heads of cabbage. Cut them off when they are small, and eat them like Brussels sprouts. Or wait till they get a bit bigger and eat them like cabbage. * Strawberry Leaves. Dehydrate them and use them to make herbal tea. * Rose Hips. If you have roses that produce hips (seed pods) when they are done blooming, wait until they get bright red, then harvest them. The pods are great for stews, tea, and jelly. For complete information on harvesting and using rose hips, check out this post. * Citrus Peels. Use a wee bit in soups, stocks, or stews. Or peel away the white pith, dehydrate, and use chopped finely or minced in baked goods. * Leek Ends. Most recipes call for only the white part of the leek, but the tougher greens are great in soups. * Bolted Collards. Snip off the bolted ends (the seed head) of collards as soon as they appear and you can keep eating the leaves for a while. Then eat the bolted head, too. They taste a lot like broccoli, raw or cooked. * Garlic Stems (Scapes). 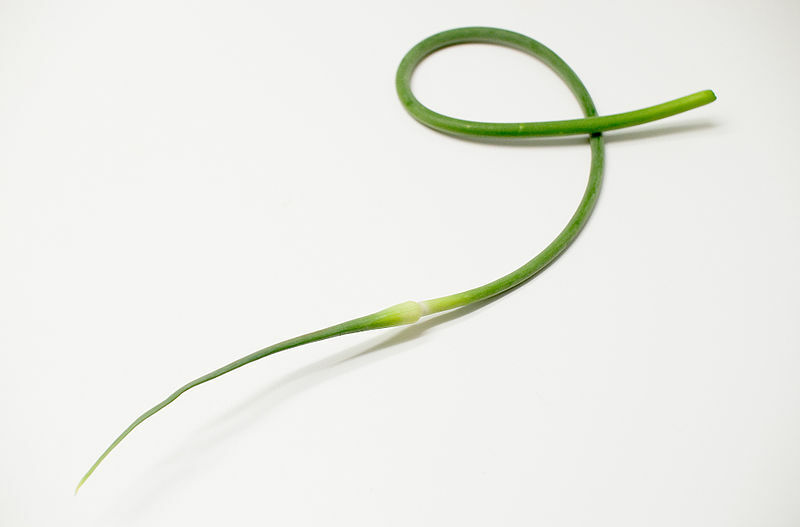 The tough stems leading to the bud on garlic plants are quite edible - and cutting the stems off encourages plants to grow bigger bulbs. The really tough part of the stems is good for making stock or adding to soups, then discarding before serving. The less tough part - and the bulb - can be chopped or minced and cooked just like garlic cloves. For more ideas on what parts of produce you may be throwing away but could be eating, check out last year's post "Did You Know You Can Eat That?" And now it's your turn! What "throw away" foods do you eat?